how yummy do rice krispy treats dipped in chocolate sound? so yummy? 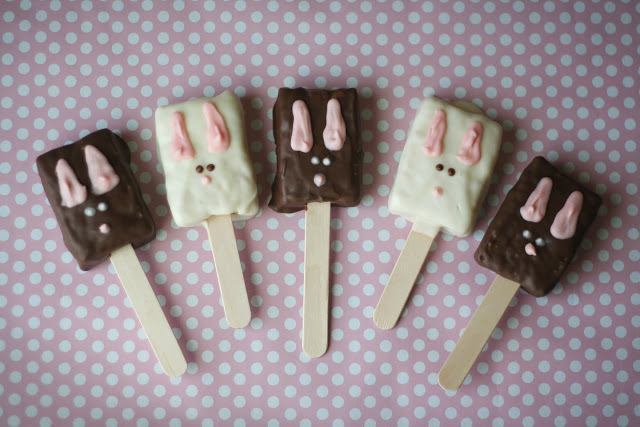 when i saw these cute little bunny pops on the ladies home journal website, i knew we needed to try them. right away. they weren’t that hard to make either. 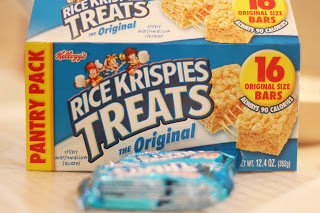 especially since we cheated and bought the pre-made rice krispy treats. 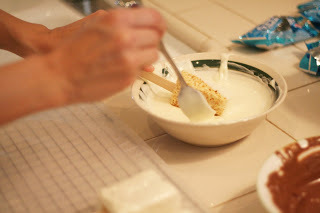 2. push popsicle sticks into the rice krispy treats. 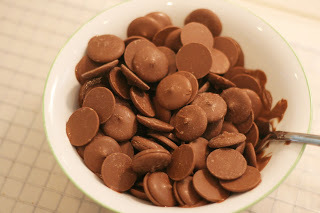 3. spoon the melted chocolate over the squares until completely covered. 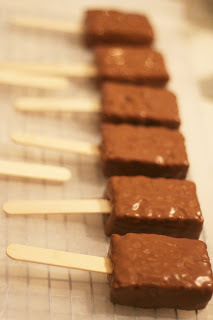 4. lay them on wax paper and place in freezer for the chocolate to set up. 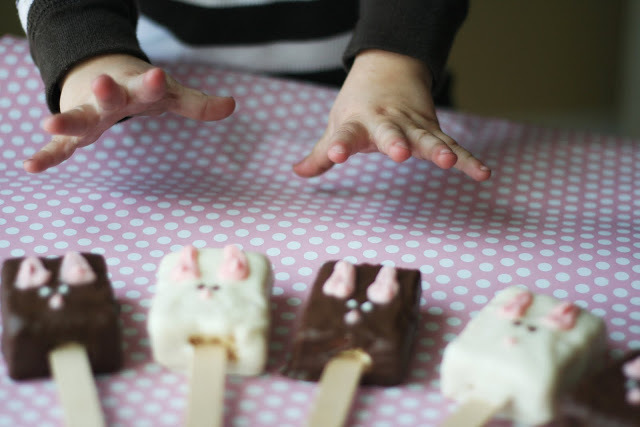 5. take some of the white chocolate and set aside (for the eyes on the chocolate bunnies). add a little drop of red food coloring to the remainder and stir until you have a nice pink. 6. after playing around and messing things up a little bit, we got the bright idea to put the pink chocolate into a ziploc bag, cut a corner off and squeeze it on for the ears. 7. we used the back of a skewer to dot the eyes and noses on. 8. put them back in the freezer for a bit. he enjoyed it. and so did the other two that were waiting patiently. We are going to have to try these! Adorable! Love these..Chase and I are going to make these tonite!!! Oh How cute are those? Love them and can't wait to make them. OH MY GOSH… SO DARLING.. GREAT PICS TOO! I puffy heart love your blog! You are so flippin creative! So glad that I get to be inspired by you! Please, stop by sometime and say hello! I love this idea! Sounds easy too! Love how these turned out and love how easy they are!! I featured these on my friday favorites! I cannot wait to share this with my grandson. Thanks for the wonderful idea! Adorable. Those are super cute! I think even my teenagers would love them! Thanks so much for sharing! what a wonderful idea and sooo easy! I love your blog I can't wait to read it everyday! How cute! I was looking for cheap basket stuffers, and these will be perfect. I think I'll whip up a batch while the kids are at school tomorrow. I love your blog! 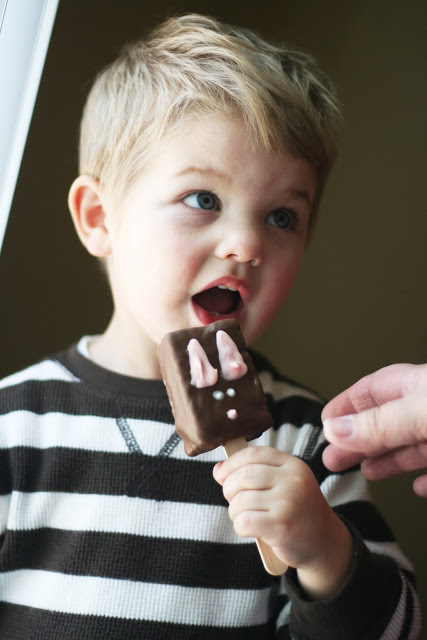 May just change up my egg dye coloring tradition for this one… way cuter and yummier. And the kids prefer the candy filled anyways. LOVE your blog. Great ideas. I'm at http://www.weloveiowa.blogspot.com. But don't really love Iowa, just in case you were wondering. Thanks so much for linking up! Happy Easter! This is an adorable craft for kids. Big fans of No Bake recipes. Will definitely be featuring it on our site!